Yesterday, I did my 4th MAF Test as part of my MAF Experiment. A brief recap: I started doing MAF (or Maximum Aerobic Fitness) training in August as a way to come back from injury and to build my running base. The idea behind MAF training is to do all of your runs at or below the aerobic threshold so as to build your aerobic base and also prevent the breakdown that happens with faster running. As part of this training, I’ve been doing a “test” every 4 weeks to track my progress. Each test consists of 2 warm-up miles, followed by 4 MAF test miles at my maximum aerobic heart rate (HR), which is 138, and ending with 1 mile of cool-down. The idea is to run the same course every 4 weeks and see what pace I can run at my MAF HR, with the goal/hope of seeing the MAF pace get steadily faster as my aerobic fitness improves. After seeing some big gains after the first month of MAF training, my progress slowed down in the second month. I knew that this third cycle of MAF training would be a challenge, as I was starting a new job with a full-time schedule and a long, daily commute. As many successful MAF-trainees will attest, the secret to success is training volume. Some suggest that 4-6 hours of running a week is optimal for MAF training. Well, I definitely didn’t get anywhere close to that over the past 4 weeks. My weekly training volume has been (in miles): 22, 8, 15, and 18 for a total of 63 miles. Compare this to the cycle before that, where I ran 21, 23, 20, and 28 miles for a total of 92 miles. So, going into yesterday’s test, I had very modest expectations. With the cooler weather, I thought I could at the very least run about the same average as Test #3 (10:26/mile), if not a tiny bit faster. What was more important to me than pace, though, was consistency — in my last MAF test, I ran mile splits of 10:15, 10: 21, 10:26, and 10:43. I don’t know why, but that big jump between the 3rd and 4th miles really bugged me. It made me feel like the first 3 miles were a fluke. Anyway! On to Test #4. The weather was cool and overcast (yay! ), but also windy (boo!). After a somewhat shaky warm-up, featuring not one, but two pit stops, I tentatively began the test. I felt pretty good throughout and logged the following splits: 10:17, 10:22, 10:15, 10:25, for an average of 10:20/mile. That’s only 6 seconds faster than Test #3, but I’ll take it! I was really happy to see consistent, tight splits. It definitely feels like I’m still improving with MAF training, slowly but surely. Hopefully, as I continue to adjust to my new schedule, I’ll be able to increase my training volume in this next 4-week cycle. Before I can adequately test that idea out, however, I’ll be leaving for Taiwan later this week for about 11 days, so that’s going to mess with training a little. While I’ll be able to run more consistently, I won’t be doing any long runs while I’m there. Plus it’s going to be warmer and more humid, so I’ll have to adjust my expectations as far as pace goes. 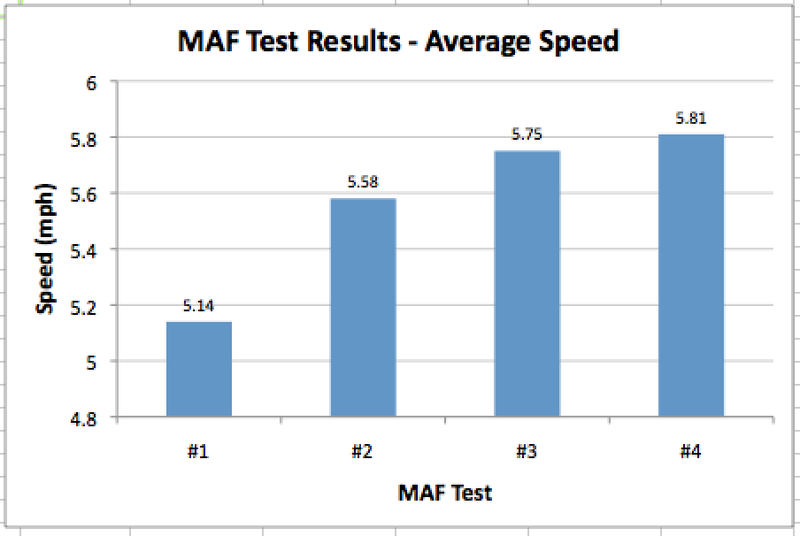 Without further ado, here’s my favorite aspect of MAF training — the numbers! Great update! Slowly but surely, that’s what MAF seems to be all about! My volume hasn’t been the greatest either, but my runs are 45 min – 1 hr long, and since I just started back running a month ago, I don’t want to jump in to too long of runs/too many miles. I wonder if Phil Maffetone gets pleasure out of the mental anguish he puts runners through with his method, lol!! Haha, that would be pretty sadistic of Dr. Maffetone! See? Patience pays! (Ok, easier said than done.) Enjoy your Taiwan trip! Eat all the things! LOVE your costumes! Those are so cute! And great progress w/ the MAF training. Comparing this week to week 1 is huge! 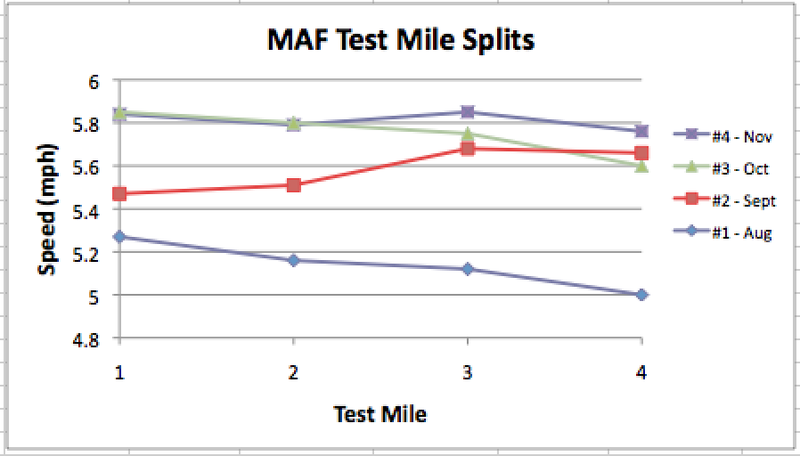 Love your MAF numbers chart, I am just getting started on Maf: I am 67 and been running too fast for too long.